NEW! "Southeast Camper Dutch Oven Group"
Do you enjoy cooking with a Pie Iron? The year has flown by and we had our last DOG (Dutch Oven Gatherings) for the year in September. We had a great summer with many new cooks coming to see us at our DOG’s. We get ask many questions about how our club operates, how to join, etc. Well, it’s simple, just show up and cook. We do not have membership fees, all we ask for is a small donation to cover the cost of a picnic shelter, paper plates, plastic ware, etc. Many of us camp out for the weekend and all are welcome to join in. We have a Weary Travelers Dinner Friday night for those coming in late. We know how hard it is to set up your site and cook dinner too. If you need help getting set up. we are here for you, no problem, just ask. We meet at the reserved shelter to set up our cook area about 8:30 on Saturday mornings, it is not an official breakfast, but many of us cook and share grub. Then we spend time hanging out, catching up on the latest gossip or taking a nap. We are here for relaxation and fellowship. No pressure. You can tell when folks are getting ready for the Cast Iron Buffet, the place starts to quiet down and the smoke starts to rise as we all get ready for the 2nd wave of cooking. As the Dutch Ovens start to appear on the table, we get excited, as the lids of the pots are lifted and we get to peek at all the food, WOW! the place get exciting. The cameras are clicking away. . . .
After our multiple trips back to the buffet and everyone winds down, we have door prizes to give away and we announce any upcoming events and club news. The we all assemble for our group photo. The only hard part about a DOG is packing up our equipment at the end of the day with a full belly. For those that are camping we drift back to the campground for a group fire and talk about the wonderful day we had, along with upcoming events and other family outings. This should give you an idea of what we do and we hope it inspires you to get out and join a Dutch Oven Gathering. Feel free to stop by and visit, guest are always welcome, ask question as we are here to help. Spring has come and we are on the edge of summer. It is time to get fired up and get out of the house and go camping. 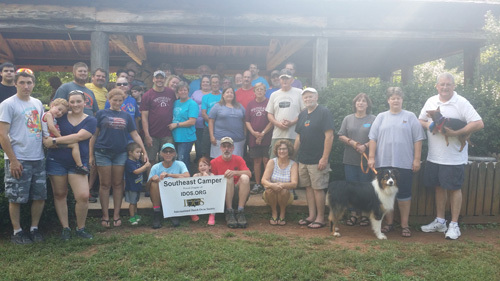 For most of us at Southeast Camper, we have been on 4 or 5 camping trips or a DOG or two this year. This year will be jam packed with events. Visit the Event Calendar for more information. So far this year we have had 3 DOG’s or Dutch Oven Gatherings, The Southeast Camper “Cabin Fever” DOG, The NC-VA 2 State DOG and The Southeast Camper “Spring” DOG. We have many more planned. Some of our club members will be going to The National Dutch Oven Gatheing at The Kansas State Fairground in Hutchinson, KS. The NDOG 2018 is going to be BIG, and if you’ve never been to one, it is well worth it to go. Keep your ovens clean and ready for cooking. Join a DOG near you. What kind to Buy? Aluminum or Cast Iron? Why Use a Fire Pan? How do we know when its done? We use the smell test. When it smells done, its done. Copyright © 2006-2014 All Rights Reserved.